Printed by Krebs in Frankfurt am Main, Germany. This is the only stamp ever issued by Canton Basel - and the world's first tri-colored issue! The dove in the center is embossed. These stamps were printed in sheets of 40 - 5 rows of 8 stamps each. Proofs was made but never issued in black, vermilion and green. 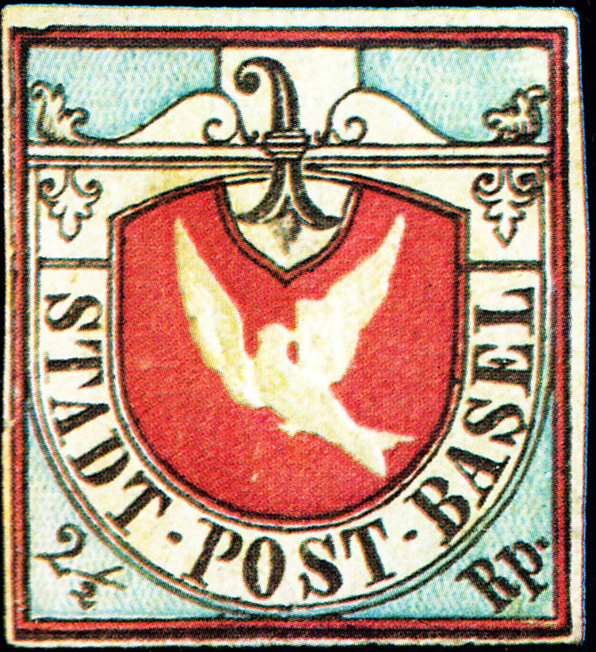 The Basel Doves were valid until September 30, 1854. The site Basler Tauben attempts to show all known copies of the Basel Doves - have a peek. A Swiss dealer Gottfried Honegger has some eye-candy - and stamps for sale! Image from James Mackay, The World of Classic Stamps, 1972.